This essay is based on a presentation co-authored with Wojciech Szymanski, M.A., which was read at the Fantastic Literature Conference 2016 (Religious Topics in Fantastic Literature) at the University of Lodz (Lodz, Poland), September 19-20, 2016. J.R.R. Tolkien (1892-1973) is widely reputed to be the archetypal author of fantasy in the modern period, or what has come to be termed “high fantasy”. Some have said that Tolkien both inaugurated and closed out the high fantasy subgenre, since anything that follows him is bound inevitably to appear derivative. Over the years, there has been a wide-ranging debate on whether Tolkien’s The Hobbit and The Lord of the Rings, are more “pagan” or “Christian” in spirit. In this presentation, we will be looking mainly at J. R. R. Tolkien’s The Hobbit (1937) and The Lord of the Rings trilogy (originally published in three volumes in 1954-55). The presence of the Elves and other fantastically imagined races, as well as the veneration of nature, are said to make these works more “pagan” – rather than rooted in Christian monotheism. Indeed, the works seem to uphold a “pluralism” of different “free races” – as opposed to a clearly univocal monotheism. The works seem to cherish the pluralism of “difference” – in contrapuntal contrast to the stark theme of “One Ring to rule them all – and in the darkness bind them”. In real life, Tolkien was a devout Catholic. There have been a number of works tracing Tolkien’s Catholic inspiration for the so-called Middle Earth legendarium, or the Arda mythos (as it is sometimes called). Notable among these works is Craig Bernthal’s Tolkien’s Sacramental Vision: Discerning the Holy in Middle Earth (Second Spring Books, 2014). 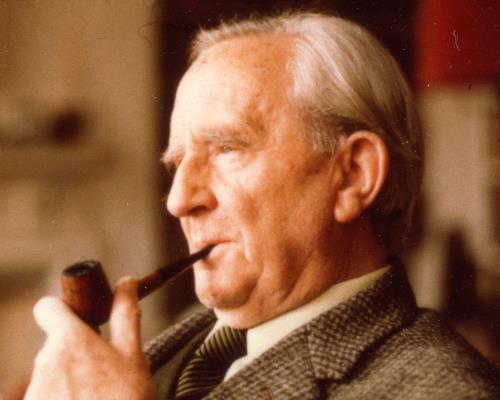 Given the psychological matrix of devout Catholicism from which Tolkien’s works sprang, it would hardly be surprising if his creative endeavours did not carry at least a tinge of Christian underpinnings. One of Tolkien’s great appeals to readers is that he offers a world replete with meaning at every level. To read and reread Tolkien is to share his sense of wonder and holiness, to be invited into the presence of a “beauty beyond the circles of the world”. It is to fall in love with a universe that has a beginning and an end, where good and bad are not subjective choices, but objective realities; a created order full of grace, though damaged by sin, in which friendship is the seedbed of virtues, and where the greatest warriors finally become the greatest healers. The vision enunciated by Tolkien could be termed as “pre-modern”. It hearkens back to the idealized Middle Ages of Christendom, to a world – as Tolkien put it -- of “less noise and more green”. Obviously, Tolkien’s works did not arise ex nihilo. There was a societal and cultural context out of which his works sprang, these being roughly-speaking Britain/England. Tolkien was deeply shaped by pre-World War One Britain, a society where propriety and decorum and so-called civilized values were not yet out of fashion. That society was to be sorely tested by the Great War, in which Tolkien fought heroically. The original inspiration of the hobbits was said to be the ordinary British “Tommies” who were living in the trenches (“holes in the ground”) of the Great War -- and rose to great levels of heroism, despite their preference for the simple comforts of home. This elevation of hobbits representing so-called ordinary people rising to extraordinary heights of courage is one of the main themes of The Hobbit and The Lord of the Rings. At the same time, Tolkien had a profound appreciation for the element of hereditary monarchy and aristocracy in human existence, which he saw as being increasingly under attack in Britain. The Elves were clearly “natural aristocrats”. Also, part of the vision of Tolkien as a Catholic living in the British Isles was a sense of tragedy. For centuries since the time of Henry VIII, Roman Catholics had faced varying degrees of persecution in the British Isles, especially so under Oliver Cromwell. The fact that the Elves are increasingly harried and diminished throughout the unfolding of the Middle-Earth legendarium may be a reflection of this sense that Roman Catholicism was increasingly attenuated in the British Isles. As well, Oliver Cromwell could be seen as a possible inspiration for the figure of Sauron. Indeed, as Lord Protector, he has been considered a precursor to twentieth century dictators. Also, part of the Roman Catholic experience in the British Isles was identified with a yearning for the restoration of the Stuart dynasty, epitomized by the Jacobite Rising of 1745, led by Bonnie Prince Charlie (Charles Edward Stuart). For these Roman Catholics, the British Isles were seen as being under the occupation of a hostile, usurping dynasty (the Hanoverians). The romantic resonance behind the historical desire for a Stuart restoration may play a part in an over-arching theme of kingship in The Lord of the Rings (the third volume being significantly titled, The Return of the King). In the late nineteenth and early twentieth century, it was very possible for a tension of sentiment and feeling to exist between the person who wanted to be a “good Englishman” -- and the person who wanted be a “good Roman Catholic” on the other. It could be argued that the dynamic arising from an attempt to effect a resolution of this tension was one of the origins of the Arda mythos. Tolkien’s works did not arise without some precursors. Tolkien, for example, had read George Macdonald’s and William Morris’s fantasy works. Britain was also the locus for the Arthurian legends and their literary renderings. Tolkien also had high respect for “Beowulf”, the great Old Anglo-Saxon poem. Another influence was the epic poem “The Ballad of the White Horse” (1911) by G. K. Chesterton (1874-1936) portraying an idealized King Alfred. Much of Tolkien’s creativity was shaped by his interactions with the Inklings group, especially C. S. Lewis (1898-1963), whose own children’s fantasy series, The Chronicles of Narnia appeared in seven volumes between 1950-1956 – beginning with The Lion, the Witch, and the Wardrobe. Mark Wegierski is a Canadian writer and historical researcher.